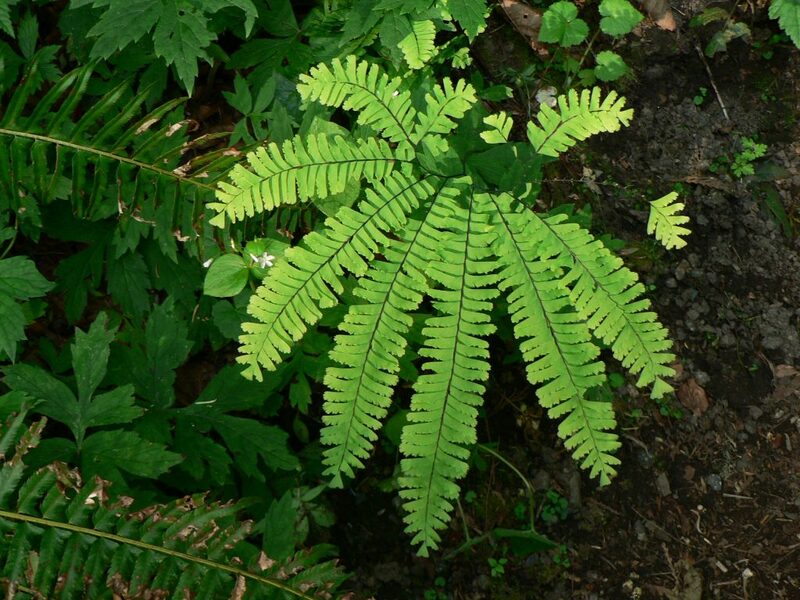 Adiantum pedatum is a fern from a creeping rhizome to 0.5 cm thick. Leaves (fronds) arising individually or few together along rhizome, twice pinnate; stalk 10-60 cm long, wiry, shiny, purple-black; blade set at right angles to stalk, 10-40 cm long and wide, horseshoe- to nearly ring-shaped with a forked, semi-circular branching pattern, primary leaflets (pinnae) 2-6, 12-22 cm long, 5-9 cm wide, all arising on one side of the rachis (axis) each pinna with numerous, fan-shaped, secondary leaflets (pinnules) in a pinnate arrangement (Radford et al. 1968), midrib close to inner edge. Spore cases 0.2-0.5 cm long, 0.1 cm wide, along the lobed outer edges of the pinnules. Habitat: Understory of undisturbed moist woods, high nutrient, humus-rich, soil, pH 4.6-6.6, tolerant of shade, somewhat tolerant of fire, intolerant of drought, salt (USDA, NRCS 2006). Notes: Spreads very slowly. 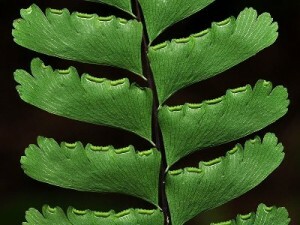 New fronds occasionally eaten by rabbits (Gargiullo, personal observation). Listed as exploitably vulnerable in New York State (USDA, NRCS 2017).